Product prices and availability are accurate as of 2019-04-21 11:55:13 EDT and are subject to change. Any price and availability information displayed on http://www.amazon.com/ at the time of purchase will apply to the purchase of this product. 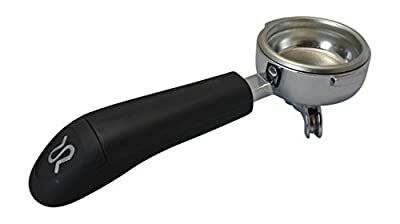 This Rancilio Double Spout Portafilter comes standard with the Silvia espresso machine, but is also compatible with Rancilio commercial models, along with many other home and commercial machines that use a 58mm E61 filter. With the heavy-duty construction and sleek design that Rancilio is known for, this complete portafilter and basket will meet your home or commercial barista needs for years to come. Rancilio Silvia Complete Double Portafilter for Home and Commercial Espresso Machines Includes standard double (14g) stainless steel basket. Fits all versions of the Rancilio Silvia home espresso machine, along with all Rancilio commercial models (Silvia, Epoca, and Classe). Genuine OEM parts (part numbers 10070108 and 40100010) . Rancilio logo on handle.